BlockStudio from CAD Design Software is probably the only tool around that will satisfy your every need as far as block editing and block manipulation. It comes with a range of 16 different and powerful features to meet your every need. 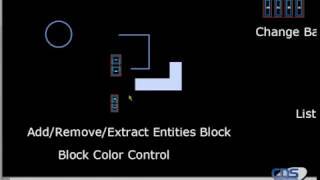 Adding entities to blocks, deleting entities, changing colors, layers, changing just parts of blocks? Block Studio has you covered. You might be thinking, will it also help me quickly delete entities from a block, rename blocks, fill blocks with polylines or even find block duplicates hidden within my huge design? Yes, BlockStudio does all that, and much more! A number of these functions are also available as single Apps, see our full catalog. The application will start in Trial-Mode and allow 20 trial runs or 1 day, whichever comes first.